Daniel Humm has been one of my favorite chefs since I met him and his team a few years ago in Piedmont, where we were staying in the same hotel. Since then, Humm’s career has taken off big time, culminating with a number of prestigious awards. Most recently, Humm’s Eleven Madison Park claimed the #5 ranking in The World’s 50 Best Restaurants, a survey sponsored by San Pellegrino and Acqua Panna. At NoMad, Humm offers a style of pure, ingredient-driven cooking that is quite similar to what he was doing a few years ago, before Eleven Madison Park took off in a much more ambitious direction. That is fine with me, as I often miss the previous version of EMP. The décor and overall feel at NoMad are much more informal and the rooms can be a bit noisy for my taste. Sometimes I just sneak into the bar, which is usually pretty calm during lunch. The lunch was fabulous from start to finish. 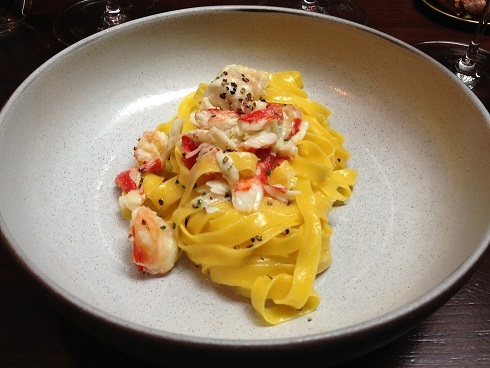 The Tagliatelle with King Crab was bright, flavorful and totally delicious. It was a perfect match for the 2008 Friulano Filip from Miani, a wine that is drinking spectacularly well right now. The Filip had just enough richness to complement the Meyer lemon and black pepper. Humm’s tagliatelle brought back memories of a lunch I had at Eleven Madison Park a few years ago with my family. One of my criteria in evaluating restaurants and chefs is the way they cook for children. In other words, are the kids’ dishes prepared with the same exacting standards as the food that is presented to the adults? At Eleven Madison Park, my three year-old son was served a plate of tagliatelle that would have satisfied the most discerning of palates. I learned an important lesson that day. NoMad’s whole-roasted chicken for two is worth a visit on its own. Rich, flavorful and lusty, the chicken is also a great dish for wine, especially Pinot Noir, Sangiovese or Nebbiolo. 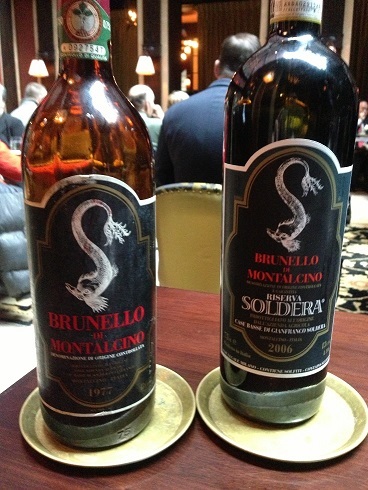 I brought a bottle of Soldera’s first Brunello di Montalcino, the 1977. My guests brought the 2006 Riserva. I joked we were tasting the first and last vintages of Soldera, but I had not idea then how right I would turn out to be. A few weeks earlier a disgruntled former employee had drained all the vats at Soldera, pouring the vast majority of vintages 2007-2012 literally down the drain. But some 2006 Riserva in bottle was not damaged. In the intervening months, Soldera resigned from the Brunello producers Consorzio for reasons that aren’t entirely clear, and decided to label his remaining 2006 Riserva plus subsequent vintages as simply IGT Toscana. What a strange turn of events. But let’s get back to the wines. A few years ago, I helped organize one of the most complete verticals of Soldera wines ever held. For that event, I was able to find bottles of the inaugural 1977 Brunello di Montalcino. I opened the bottle that looked better, and kept a second bottle, which had a lower fill, for another occasion. Well, that occasion finally arrived, and I was not disappointed. Oddly enough, this bottle was in much better shape. Go figure. Although fully mature, the 1977 Brunello di Montalcino had great purity of fruit and a Burgundian delicacy to it, until the savory Sangiovese notes and a trademark acidity kicked in. What a gorgeous wine. So was the 2006 Brunello di Montalcino Riserva. One of the most perfumed, polished Brunellos I have ever tasted from Soldera, the 2006 Riserva was light on its feet and pure grace. It will be interesting to see if the 2006 Riserva puts on weight over the coming years. On this day, it was totally striking. Several subsequent bottles have all been as good or better.